Whether you grow and pick your own pears or buy them at a grocery or farmers market, you need to know that pears shouldn’t ripen on the tree. Tree-ripened pears mature from the inside out and develop a mealy texture and mushy core when the flesh is fully ripe. To tell if a pear is mature, but not yet ripened, while still on the tree, tilt the pear to a horizontal or sideways position. If it’s mature, the pear stem will easily detach with a quick twist. Pears should be picked at this point, when the fruit is fully mature and capable of ripening later to excellent quality. Right after picking, growers cool pears down to between 30 and 35 degrees Fahrenheit for best quality. 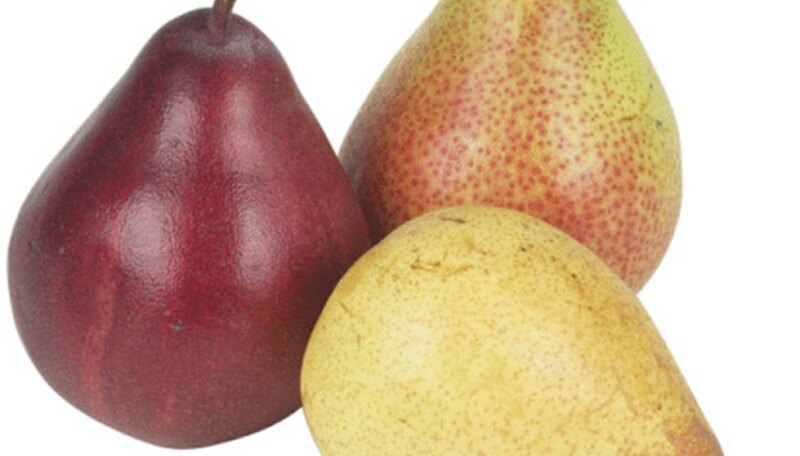 Pears don’t freeze at this temperature because the fruit sugars serve as natural antifreeze. Do the same with your pears; Bartletts require only a couple days of cooling, but winter pears, including Anjou and Comice, need two to six weeks. The key point is that you can store cooling pears for two to four months, greatly extending their “fresh” potential. Ripen them by taking some out of storage and placing them in a brown paper bag with a ripe apple; the apple’s ethylene gas will speed up the ripening process. Preserve an excess of fresh pears by freezing them. Wash and peel pears, cut them into halves or quarters and remove the core. Prevent discoloring by soaking pear pieces in crystalline ascorbic acid solution – 1 tsp. per pint of water – or similar commercial “fruit fresh” product. Rinse and drain the pears. Make a 40 percent sugar syrup by boiling 3 cups of sugar in 4 cups of water; add the pears and simmer for one or two minutes. Drain – save the syrup – and cool. Pack pears in sealable freezer bags and cover them with the syrup, leaving 1/2 inch of head space. Seal, label and freeze each bag. You can also can pears, a process that requires no freezer space, but does call for knowledge about how to preserve food safely. Can pears by either the water bath or pressure canning method. Other options include cooking up and canning spiced pears, pear puree, pear syrup, pear-pineapple jam or pear butter. You can also puree and dry fresh pears – summer pears are best – as fruit leather, or dry pear quarters or halves in dehydrator or in the oven. If you still have leftover pears, whip up some pear puree for your baby or grandbaby. For each serving combine in a blender 1/2 cup of freshly cooked or home-canned ripe pears with 2 to 4 tsp. water, formula or unsweetened apple juice and puree it until the texture is smooth. Serve your homemade pear baby food fresh or freeze it for up to one month.